The Barons Court Theatre. You have found a hidden treasure of an underground fringe theatre in London. Sited below an attractive pub and restaurant called ‘The Curtains Up’ Home to the magic shows created by Richard Leigh. 2 minutes walk from Barons Court tube station on the Piccadilly & District lines. Cross the road and walk down Barons Court Road. On the right hand side is Vereker Road. The Curtains Up Public House is here. 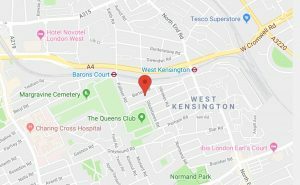 2 minutes walk from West Kensington tube station. Cross the road outside the station bearing left, then immeadiate right down Barons Court Road. Bear right at the junction with Comeragh Road, continue down Barons Court Road. The second left is Vereker Road. The Curtains Up Public House is here . Patrons who may not wish to enter the theatre through the bar may call the box office to arrange entrance via a door which bypasses the’ bar. Please call 020 8932 4747 to make arrangements. The theatre is sited underneath a wonderful bistro restaurant and bar. Please allow plenty of time to eat before the show. Drinks purchased from the bar can be brought into the theatre. The theatre is down one flight of stairs. Doors open 15 minutes before the performance. Prepaid tickets can be collected at this time. The theatre operates an open seating policy. Wherever you sit you have a good view of the performance.